We’re kicking ourselves a bit for not betting the Canadiens Team Total Under 2.5 again last night (we posted it as a lean on Twitter and Facebook, but didn’t bet it because we didn’t like the -130 odds). Montreal’s offensive struggles continued in a 5-1 loss to Los Angeles, marking the sixth time in seven games that the Habs have been held to 2 goals or less in regulation time. In fact, the only time Montreal has potted more than 2 goals in regulation this season was against the Leafs, who continue to play the highest-scoring games in the league. 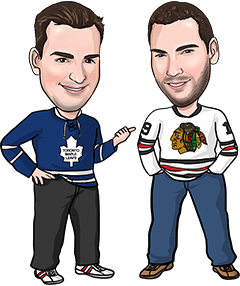 Toronto is now 6-1 to the Over following a 6-3 victory over the Red Wings last night, and most of those Overs have been “over” before the end of the second period. We went 2-0 Tuesday, with one of those winners coming on the Coyotes/Stars Under 6. We’re going right back to that well again tonight as those teams meet again in Arizona, plus we’ve got a couple more picks for tonight as well. You can find those picks below, along with breakdowns and any opinions we have on the rest of the 9-game NHL slate. Good luck! Reasons to bet Nashville: The Predators have allowed just 3 regulation time goals in their last 3 games. Simmonds could be hampered for Philadelphia after suffering a groin injury last game. Reasons to bet Philadelphia: The Flyers have scored 18 goals in their last 3 games. Nashville has won just 2 of its last 7 visits to Philadelphia, and both came in overtime. Reasons to bet St. Louis: The Blues have held 5 of their last 6 opponents to 2 goals or less. Colorado has lost 6 of the last 7 meetings. Reasons to bet Colorado: The Avalanche is 2-0 at home. St. Louis played last night and could struggle playing at high altitude on short rest. Reasons to bet Dallas: The Stars have held 4 of their last 5 opponents under 28 shots on goal. Arizona is 0-5-1 and has scored just 8 goals in its last 5 games. Reasons to bet Arizona: The Coyotes played much better defensively Tuesday in Dallas, limiting the Stars to 2 goals until Dallas scored a late empty-netter. If you don’t count empty netters, the Stars have scored 11 goals in 6 games. Reasons to bet Tampa: The Lightning has scored 3+ goals in 6 of its 7 games this season. Columbus hasn’t scored a power play goal in its last 5 games. Reasons to bet Columbus: The Blue Jackets won all 3 meetings last year by a score of 13-5. Tampa is playing its 3rd game in 4 days, 4th in 6 and 5th in 8. Reasons to bet the Islanders: The Isles have won 3 straight meetings and 7 of the last 8, and have scored 3+ goals in each of the last 7 matchups. The Rangers have lost 4 straight and 6 of 7 to start the year. Reasons to bet the Rangers: The Rangers broke out offensively for 4 goals Tuesday after scoring just 6 goals in their previous 4 games. The Islanders have given up 3+ goals in 4 of their last 5 games. Reasons to bet Vancouver: The Canucks opened up their eastern road trip Tuesday with a 3-0 win in Ottawa, the third time in 5 games that they’ve allowed 2 goals or less in regulation time. Boston has been banged up with injuries to Rask, Backes, Bergeron and Spooner, though Backes is back tonight and Bergeron may return as well. Reasons to bet Boston: The Bruins should be motivated to rebound from a poor performance in their last game, losing 3-1 in Vegas on Sunday. Vancouver has yet to score more than 3 goals in a game. Reasons to bet New Jersey: The Devils have won 5 of their first 6 games and are 3-0 on the road. Ottawa is still winless at home (0-1-2). Reasons to bet Ottawa: The Senators won all 3 meetings last year, holding New Jersey to just 2 goals. Ottawa has allowed 7 regulation time goals in its last 5 games. Reasons to bet Edmonton: The Oilers outshot Carolina 51-21 in a 5-3 loss to the Hurricanes Tuesday and are second in the NHL in shots per game. Chicago has allowed 5+ goals in 2 of its last 3 games, including a 5-3 loss last night in St. Louis. Reasons to bet Chicago: The Blackhawks have won 5 of their last 6 home games versus Edmonton and 10 of the last 13 meetings overall. Edmonton has lost 4 straight, allowing 19 goals in that stretch. Reasons to bet Carolina: The Hurricanes have allowed 6 regulation time goals in their last 3 games. Calgary could start a bit slow in its first game since Saturday. Reasons to bet Calgary: The Flames have won 4 of 5 games, scoring 4+ goals in 3 of those victories. Carolina was outshot 51-21 in its win over Edmonton on Tuesday.